Home > Archives > Amtrak Seattle King Street Station, 1970s. 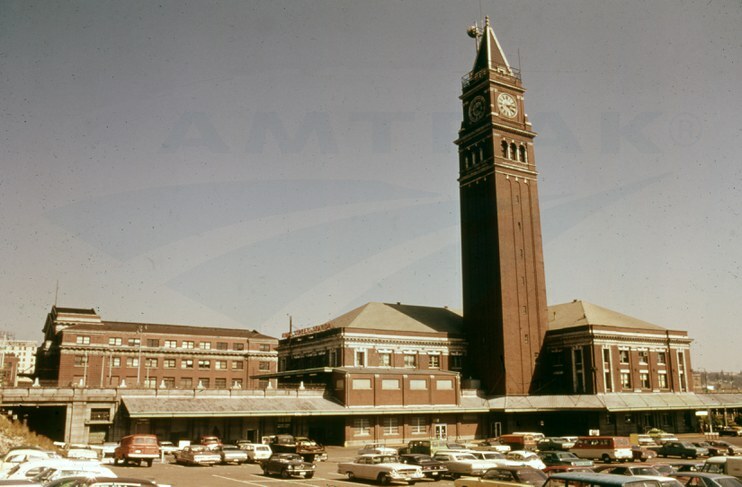 Seattle King Street Station was constructed in 1906 by the Great Northern Railway. Designed by the firm of Reed and Stem of St. Paul, Minn., which was involved with the building of Grand Central Terminal in New York City, the station is composed of granite and red brick with terracotta and cast stone ornamentation. The distinctive clock tower is a Seattle landmark and was inspired by the bell tower on the Piazza San Marco in Venice, Italy. In the late 1960s the interior was modernized according to period tastes. The ornate plaster ceiling of the waiting room was covered for the next three decades by a fabricated, lowered false ceiling. Handsome metal chandeliers were replaced by fluorescent lighting and marble and mosaics on the walls were covered with plastic laminate. Cosmetic renovations and modernization of services began in 2003 and culminated a decade later. The rehabilitated intermodal facility is a crossroads for important downtown neighborhoods, including the Commercial, International, and Stadium Districts, as well as world-renowned Pioneer Square.